Move on to 1969 or back to 1967. BJF, 1968, Level Crossing Safety, South Wales Echo, ?7 January. BJF, 1968, New Movement towards a New Wales [editorial], Voice of Welsh Industry, 8, (1): 13, January. Readers, 1968, Letters on Voice, Correspondence Column, Voice of Welsh Industry, 8, (1): 34-35, January. BJF, 1968, Cyrus Smith heads for £1/4 million, Voice of Welsh Industry, 8, (1): 36, January. [in] Voice of Welsh Industry, 8, (1): 37, January. BJF, 1968, New Laser For Cardiff, Voice of Welsh Industry, 8, (1): 42, January. Anderson, A., 1968, Letter re 'Telling the people', Correspondence Column, New Scientist: 269. Sheppard. 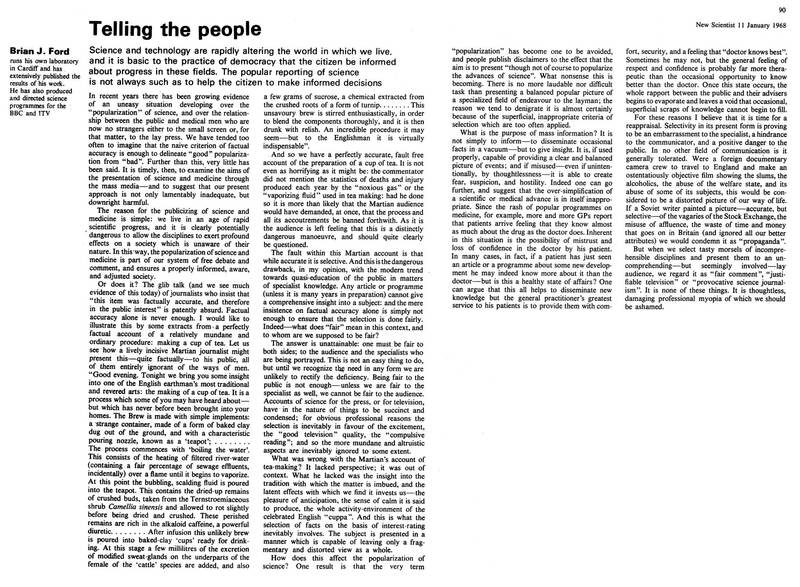 P. M., 1968, Letter re 'Telling the people', Correspondence Column, New Scientist: 269. BJF, 1968, Press, Public and the Medical Men (with reprint of 'Telling the People' vide), UK Press Gazette, 114, 6-8, 12 February. BJF, 1968, It's Spine Chilling, but it's not Science (report on article supra), cutting received from East Berlin, Morning Star, February. BJF, 1968, How can we back Wales? [editorial] Voice of Welsh Industry, 8 (2): 9, February. BJF, 1968, Developing Rôle of The Engineers' Merchant, Voice of Welsh Industry, 8 (2): 26, February. BJF, 1968, Conditions In The German Democratic Republic, [paper] German Society of University College, Cardiff, 20 February. BJF, 1968, Reclamation in Wales (and) How Grey is my Valley, The Times: vii, 1 March. BJF, 1968, Yr Iaith Gymraeg yn yr Ysgolion [=The Welsh Language and Schools, editorial] Voice of Welsh Industry, 8 (3): 7, March. BJF, 1968, Cardiff's New Weekly, Voice of Welsh Industry, 8 (3): 9, March. BJF, 1968, New Handbook for Industry, Voice of Welsh Industry, 8 (3): 31, March. BJF, 1968, Joinit - A Happy Ending? Voice of Welsh Industry, 8 (3): 35, March. BJF, 1968, How Risky is it in the Dentist's Chair? South Wales Echo, 19 March. Report, 1968, La Diffusion, Des Connaissances Et La Vulgarisation [extract from BJF in New Scientist] Paris: Bulletin CTN: 46, 20 March. BJF, 1968, The Concept of 'Antipoint' Applied to Submicroscopic Fibrillar Structures, Proceedings of the Royal Microscopical Society, 3, (1): 14-16, March. BJF, 1968, Longest Name [diary item], South Wales Echo, 15 April. Edwards, E. S., 1968, Dentist's Chair, Correspondence, South Wales Echo, 25 April. BJF, 1968, The Swing from Science [editorial], Voice of Welsh Industry, 8 (4): 7, April. BJF, 1968, New Voice contributor, Voice of Welsh Industry, 8 (4): 29 April. BJF, 1968, Science Teaching Criticised, Voice of Welsh Industry, 8 (4): 32, April. BJF, 1968, A subjective Means of Visual Comparison, Photographic Journal, 108, (4): 102-105, April. BJF, 1968, Leipzig Trade Fair, British Journal Of Photography, 115, (5623): 355, 26 April. BJF, 1968, Fat Cells [colour micrographic study], Mind Alive, 6: 162, April. BJF, 1968, Section of Human Brain Tissue, Mind Alive, 6: 162, April. BJF, 1968, Ultrafiltration in Human Kidney, Mind Alive, 6: 163, April. BJF, 1968, Human Erythrocytes [monochrome study] Mind Alive, 6: 164, April. BJF, 1968, Can we stand on our own feet, Voice of Welsh Industry, 8, (5): 7, May. BJF, 1968, Circulation increase, Voice of Welsh Industry, 8, (5): 13, May. Readers, 1968, Letters to the Editor, Correspondence Column, Voice of Welsh Industry, 8, (5): 17, May. BJF, 1968, How 'Welsh' is Welsh Industry? Voice of Welsh Industry, 8, (5): 35, May. BJF, 1968, Germ Warfare? There are worse Dangers than That, South Wales Echo: 4, ? May. [BJF, 1968, Editorial Report on Guy Hartcup's Book, [for] London: Cassells, May]. BJF, 1968, Qualified, But for What? New Scientist, 38 (599): 452-453, 30 May. Anon, 1968, Report on BJF's Frog Embryo Film, Medical News, 30 May. BJF, 1968, Neurochemistry Research in a Communist State, Medical News, 297: 11, 14 June. BJF, 1968, Anniversary Assessment [editorial], Voice of Welsh Industry, 8 (6): 9, June. BJF, 1968, In Lighter Mood, Voice of Welsh Industry, 8 (6): 27, June. Bell, D., 1968, Letter re Qualified, But for What? Correspondence Column, New Scientist 38 (603): 708, 27 June. Aylen, I., 1968, Letter, University Entrance, Correspondence Column, New Scientist 38 (603): 708, 27 June. BJF, 1968, Hazard From Eating Mussels, South Wales Echo, June. BJF, 1968, Scientific Highlight [micrograph of hæmostasis in] International Year-book of Science and Technology: 90, New York: McGraw Hill, June. BJF, 1968, The Misapplied Scientists, The Times, 57291: 20, 1 July. Evans, M., 1968, Letter, A legal Opinion, Correspondence Column, New Scientist 39 (604): 42, July. Swainson, K., 1968, Letter, Quit the Race Track, Correspondence Column, New Scientist 39 (605): 98, July. BJF, 1968, Vital Blood Cell Discovery: Scientist has Newport Link, South Wales Argus, 9 July. Report, 1968, BJF Micrograph claimed as 'highlight', Medical News: 16, 12 July. BJF, 1968, Can pop music effect the crops? South Wales Echo, July. Report, 1968, The Brian J Ford Proposal over 'Antipoint', 5th Report on Nomenclature Committee, Proceedings of the Royal Microscopical Society, 3 (3): 146, July. BJF, 1968, The Formation of a Thrombocytomorphic Body by a Human Granulocyte in vitro, The Microscope, 16 (3): 277-280, 13 July. BJF, 1968, Just what is Made in Wales? [editorial] Voice of Welsh Industry, 8 (7): 9, July. BJF, 1968, Is Industry Ready for a Design Centre? Voice of Welsh Industry, 8, (7): 29, July. Drummond-Young, W., 1968, Letter, Surfeit of Learning, Correspondence Column, New Scientist, 39, (608): 255, 1 August. BJF, 1968, The Rocket Race, History of the Second World War, 7 (6): 2837-2844, London: Purnell, August. BJF, 1968, Chemical Warfare, ibid: 7, (6): 2845-2850, London: Purnell, August. BJF, 1968, Doctors at War, ibid: 7, (6): 2851-2856, London: Purnell, August. BJF, 1968, Are our Souvenirs Worthy of Wales? [editorial] Voice of Welsh Industry, 8 (8): 7, August. BJF, 1968, New Correspondent for Voice, Voice of Welsh Industry, 8 (8): 31, August. BJF, 1968, Dysetymorrhoeic Hypercharismosis Axe Bid Plea, Medical News, 30 August. Anon, 1968, Profile of Brian J Ford, Mensa Journal, 115: 4-5, 1 September. BJF, 1968, East Germans Fell Silent [news report], Sunday Times, September. BJF, 1968, Characteristics of an Experimental Microenvironment for Locusts, Schistocerca gregaria (Forsk), Entomologists' Monthly Magazine, 104: 170-179, dated July/August/September, (published 14 February 1969). BJF, 1968, Eyes in the Sky, History of the Second World War, 7 (10): 2964-2968, London: Purnell, September. BJF, 1968, This Reservoir should Not be Built, Voice of Welsh Industry, 8 (9): 9, September. Report, 1968, L'Organisation Et La Politique De L'Ensignment, [extract from BJF in New Scientist], Paris: Bulletin CTN: 14: 784, 10 October. BJF, 1968, Wales Stakes a Claim for New Airport Site, Voice of Welsh Industry, 8 (10): 9, October. Report, 1968, Voice of Welsh Industry publishes New Airport Site, Financial Times, October. Reader, 1968, Correspondence Column, Voice of Welsh Industry, 8 (10): 39, October. BJF, 1968, Getting the Message Across, Medical News, 315: 12, 18 October. Anon, 1968, Ability to Communicate, (leader column supporting above article), Medical News, 312: 14, 18 October. BJF, 1968, Too many Scientists? New Scientist, 40 (621): 257-258, 31 October. BJF, 1968, Assistance or Control [editorial], Voice of Welsh Industry, 8 (11): 7, November. Letters, 1968, Correspondence Column, Voice of Welsh Industry, 8 (11): 12, November. Berry, M., 1968, Letter re: Too Many Scientists, Correspondence Column, New Scientist, 21 November. Garner P, 1968, Letter re: Too Many Scientists, Correspondence Column, New Scientist, 21 November. Holloway, B, 1968, Letter re: Too Many Scientists, Correspondence Column, New Scientist, 21 November. Smith, K., 1968, Letter re: Too Many Scientists, Correspondence Column, New Scientist, 21 November. BJF, 1968, Private Eye Material, 26 November. BJF (editor), 1968, Science Diary, 128pp, 3rd edition for 1969, London: Letts, December. BJF, 1968, A Question of 'ISMS' [editorial], Voice of Welsh Industry, 8 (12): 7 December. Letters, 1968, Correspondence Column, Voice of Welsh Industry, 8 (12): 31, December. BJF, 1968, The Schoolboy Scientist [in] The Schoolboy's Diary: 58-61, Letts, London: December. BJF, 1968, German Democratic Republic, [Special Supplement Edited by BJF] 4pp, The Times, 18 December. BJF, 1968, MAO 'flu' - You're Probably Immune Anyway, South Wales Echo: 7, 24 December. BJF, 1968, Germany's secret weapons, History of Second World War, 8 (6): 3286-3289 , London: Purnell, December. BJF, 1968, Formation of a Thrombocytomorph (abstract) Biological Abstracts, 40732, December.